General Assembly starts work on FY16 budget. The budget reform work necessary to finish up Fiscal Year 2015 and start FY16 remained on the table this week as Illinois House committees began to hold hearings on Illinois spending plans. The first hearings by the House appropriations committees began on Thursday, February 26. In the first committee hearing, the new heads of three of the State’s biggest-spending agencies – the Department of Public Health (DPH), the Department of Human Services (DHS), and the Department of Healthcare and Family Services (DHFS) – introduced themselves to the House of Representatives. All three were appointed by Governor Bruce Rauner. Major work will be necessary to develop a spending program that does not flow money out faster than it comes in. DHFS (http://www2.illinois.gov/hfs/Pages/default.aspx), in particular, is a department of key interest to budget watchers. It handles the multi-billion-dollar Illinois Medicaid program. Controversial decisions and hard choices are expected to be made. Representative Patti Bellock has taken the lead in working to push for Medicaid budget reforms. A DHFS overview of the implementation of the reforms so far enacted, and the current budget status of Medicaid, can be found here (http://www2.illinois.gov/hfs/agency/Pages/Budget.aspx). Further work remains to be done. With a shortfall estimated at $1.6 billion, many key spending areas in the FY15 budget are scheduled to run out of available funds prior to the end of the fiscal year on June 30, 2015. The FY16 budget is even further out of balance. The “structural deficit,” the statutory commitments made by past Illinois administrations is a focus of attention by both Governor Rauner and the General Assembly at this time. Gov. Rauner appointee wins worldwide attention. Widely-read newsweekly “The Economist” this week featured Illinois appointee George Sheldon. The former Florida child welfare agency head was picked by Governor Rauner to perform a massive cleanup of Illinois’ troubled, 2,000-employee Department of Children and Family Services (DCFS) (http://www.illinois.gov/dcfs/Pages/default.aspx). The London-based newsmagazine published a feature on Rauner and Sheldon on Monday, February 23 (http://www.economist.com/blogs/democracyinamerica/2015/02/social-services-illinois). Illinois’ child-advocacy and child-oversight services came under severe scrutiny late in the last Springfield administration after an investigation by the “Chicago Tribune” uncovered criminal activity in and around Illinois residential treatment centers for juveniles. The uncovered conduct included sexual assault and abuse (http://www.chicagotribune.com/news/watchdog/rtc/chi-dcfs-director-resigning-following-harsh-treatment-investigation-20150107-story.html#page=1). Illinois’ fifty-odd residential treatment centers for juveniles are charged with the task of being a “safe space” for challenged children and young people, including wards of the state and juveniles referred to residential care by a court. Problems abound, however. Runaway activity is reported to be common, and psychotropic drugs have been prescribed for 10.8% of the young Illinois residents. Similar problems in Florida were alleviated by Sheldon’s leadership, from 2008 to 2011, at the Florida Department of Children and Families (http://www.myflfamilies.com/). Prior to entering public service, Sheldon was associate dean of the St. Thomas University School of Law, located in greater Miami. Peoria continues to respond to news of new Caterpillar headquarters building. The Caterpillar facility, announced on Friday, February 20, will enable the global machinery manufacturer to consolidate 3,200 employees who currently work in supervisory and executive positions throughout the Peoria area. WEEK/Channel 19 describes the hopes of Caterpillar’s management: http://www.cinewsnow.com/news/local/CAT-hopes-new-HQ-will-attract-the-next-generation-of-employees-293766031.html. Caterpillar told supporters this week that they plan to implement the construction of their new global headquarters in a manner that will minimize disruption of operations. The new building complex, which will be clad in glass and Caterpillar yellow, will be constructed and operations transferred over what is preliminarily expected to be an eight-year period. Supporters of the construction project were making plans this week for the development of a downtown neighborhood to surround the headquarters. Amenities in the vicinity include historic buildings, the Illinois River, riverfront green space, and a museum/planetarium complex. To conclude, I’d like to say what an honor it was to recently be appointed to the Illinois Veterans Advisory Council. In this council I plan to give a strong voice to veterans within our state government, and also identify ways to better the lives of our state’s veterans by providing information on all available Veterans Benefits to those who need them. 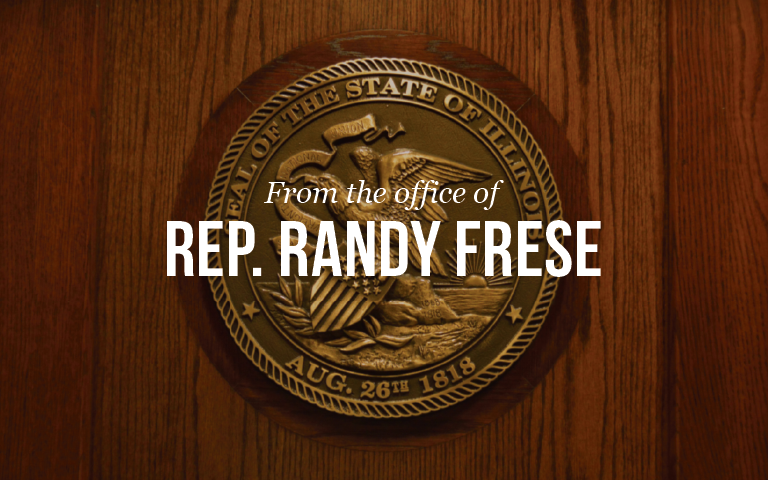 I’d like to encourage all of my constituents within District 94, if any issue arises that I may be of assistance to, please do not hesitate to contact my office at (217) 223-0833, or use the Contact tool from my website.